We love breakfast here in the Porter House. So much so that sometimes we have it for dinner. I Know Right. Anywho, Being a Chef, a Baker and a Foodie I loathe the Food Network. And one of my all time faves is Ree Drummond A.K.A Pioneer Woman. So when you combine Ree Drummond + Breakfast together you get AWESOMENESS! That’s where the Breakfast Burrito comes into play. Now dont get me wrong Ree’s recipe is great, but I think it takes a lot of time. So like always I remixed it and you know what Sweetie and I love my version just as much. And it’s quick & easy! 1. Saute diced onions and bell peppers. 2. Add ground sausage to onion/pepper mixture. Brown until done; Drain on a paper towel. 3. Cook hash browns in the same pan. 4. While the hash browns are cooking – In a large mixing bowl, whisk eggs, milk, salt and pepper. 5. Now add the browned sausage mixture back to the pan with the cooked hash browns. 6. Next add the eggs to the sausage mixture and cook until the eggs are done, stirring gently. 7. After eggs are done & everything is incorporated – lay a tortilla on a flat surface. Place egg mixture in the middle of tortilla. Top with cheese. Fold both sides inward. Next fold over the end closest to you and begin to roll into a burrito. 8. Serve with salsa, sour cream, or plain. Your choice. *Chef’s Note – This recipe makes alot of burritos. So for the extra leftovers wrap them individually in plastic wrap and place in a freezer ziploc bag. When you are ready to eat one just take it out and warm it up in the microwave. Perfect for that Breakfast On The Go! 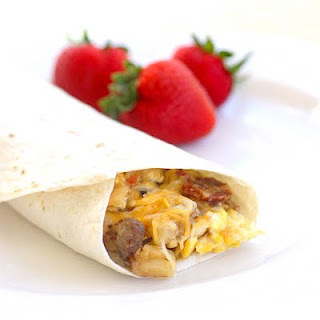 Posted on July 31, 2012, in Lady Fab Cooks and tagged breakfast, burrito, food, ground sausage, hash browns, recipe, the porter house grille. Bookmark the permalink. Leave a comment.